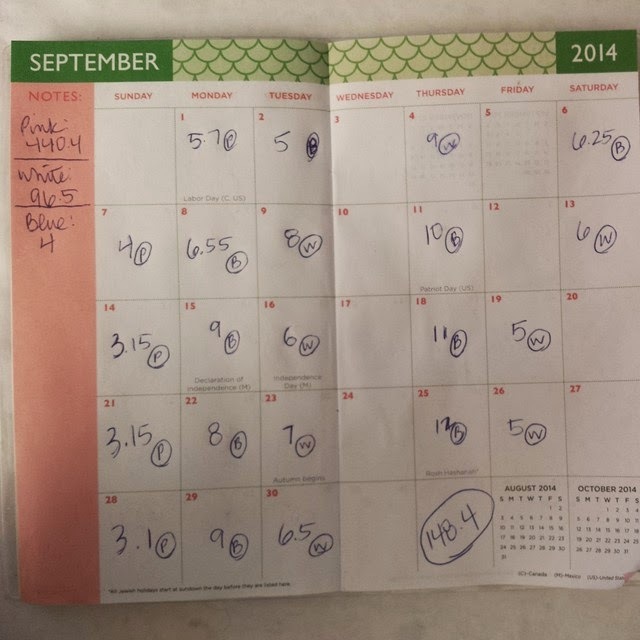 Today wrapped up the month of September…which means today was my last day to log miles for the month of September. I logged an amazing 148.4 miles in September! WOW! 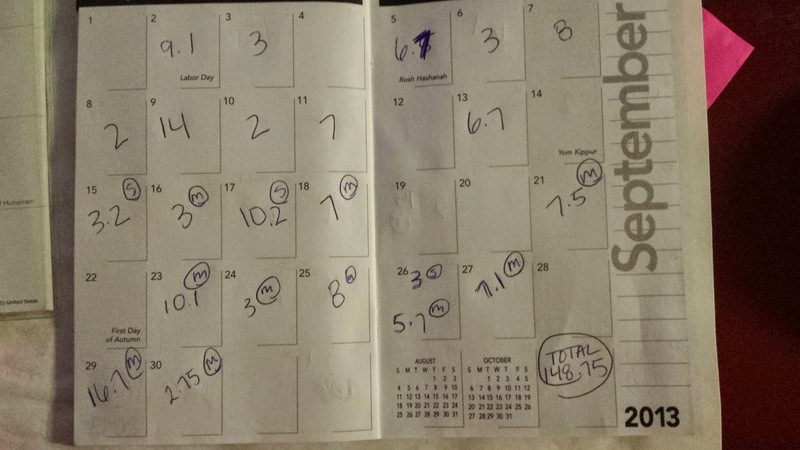 Last September was the last time I logged so many miles and my total for September 2013 was 148.75 (just .35 more than this month). Now I want to talk a little bit about last September. I ran all those miles last year at this time, not because I was training for anything but because I was running away from something. I was running away from my emotions and my post-traumatic stress (PTS…a “step down” from full blown PTSD). Why was I having PTS issues? If you’ll recall (if you’ve been reading my blog that long, that is), a co-worker of my attempted suicide with a gun. I had no idea how to deal with this. I contacted my agency’s EAP (employee assistance program) and they set me up with a therapist. However, that therapist wasn’t accepting any new clients. So, I have no clue why she was even still on their list of therapists. Instead of calling EAP back and finding a different therapist, I just opted to deal with it on my own. I started running…A LOT. I was running almost every day every week. After 5 weeks of this, I had completely burnt myself out. I had met with a trainer at my gym for a free consultation and she had put together a strength training workout and a weekly schedule for me for my running. After that 5 weeks, I attempted to “switch gears” and start doing the program she made for me…instead, I just stopped. I completely stopped working out. I had already signed up for the Rock’n’Roll Half Marathon in San Antonio, TX that happened in November of last year. I ran a cumulative of about 1.5 hours in the 6 weeks between when I stopped running (and also completely stopped any and all other forms of exercise as well) and when the half took place. So, yea, I wasn’t even remotely trained for this race…but I wasn’t about to let $120 go to waste, so I went and ran it anyway. I didn’t walk right for at least 3 days following the race. Anyway, my point is, last year I racked up about the same amount of miles in the same month but it was for the wrong reason so it wasn’t healthy. This year, I’m running with a healthy purpose: training for my very first full marathon. I’m mentally in a much better place than I was at this point last year. But, I have to be honest, my relationship with food is still in the same place. I’m trying to change that. I really am. If I want to get back down to 170-ish, I need to get a handle on it. One step I’m taking in that direction is to challenge myself…and I invite the rest of you to join me on this challenge. I am challenging myself to NOT eat any restaurant food (fast or sit down) for the entire month of October unless it’s absolutely unavoidable (meaning unless I’m out with friends and they want to go eat out and it’s not something I can really duck out of…and in that case, I will get the healthiest thing I can find on the menu…grilled salmon, grilled chicken, steamed veggies, that kind of thing). 1. If I gave you $10,000 what would you spend it on? 2. If you could watch your favorite movie now, what would it be? 3. If you could talk to anyone in the world, who would it be? I would love to have a nice, looooooong conversation with Graham Hancock about everything concerning his book Fingerprints of the Gods. I love that book…in fact, I need to read it again soon. It is definitely one of my favorite books ever. 4. If you could wish one thing to come true this year, what would it be? 5. If you could live in any period of history, when would it be? During the time of Sumeria. I would really, REALLY love to see how the world was back then and what the culture was like. 6. If you could change anything about yourself, what would it be? My relationship with food. I don’t want to be addicted to it. I don’t want it to have the power over me that it has right now. I know a lot of people that also have this problem. Some have learned how to deal with it, some have maybe even learned to switch it off and retrain themselves…but I know for most it is an almost daily struggle. I love eating healthy but sometimes it’s just not easy…it’s downright difficult and time consuming and sometimes even frustrating. 7. If you could have any question answered, what would it be? 8. If you could watch your favorite TV show right now, what would it be? I’m going to go with Once Upon a Time for this question. I want to watch it from the beginning. When it first came on a few years ago, I didn’t have actual cable, I had one of those digital receivers and when I would watch it on TV, a lot of the time the signal would cut out and I would miss critical points in the episodes, so I just stopped watching it. now, I want to buy it all on DVD and watch it from the beginning. 9. If you could have any kind of pet, what would you have? I just heard of this breed the other day and I’m totally infatuated with it. it is the Lykoi cat. They’re only in their first generation (so they don’t know about any health problems or anything like that the breed might have). They’re super cool. Their nickname is the “werewolf cat.” I want one. I don’t care how much it costs, I want one. 10. If you could do your dream job 10 years from now, what would it be? Never knew anyone else who also likes Graham Hancock, how funny! He was on a radio show we listen to once and I actually saved the podcast b/c he was so interesting.